To receive your FREE New Owner information brochure and help the AJC serve you better, please fill out and submit the following questionnaire. You must be 21 years of age to receive an owner brochure. Do you currently own any purebred Arabian horses? Have you ever been involved in any competitive activities with Arabian horses? Do you know anyone who is (or has been) involved in Arabian racing? Are you involved in horse racing with another breed? 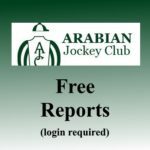 How did you hear about Arabian Jockey Club? Have you ever been to an Arabian race? What type of Arabian race horse ownership interests you? Would you be interested in attending an AJC New Owner Seminar to learn more about Arabian racing? *By submitting this information, you will receive a link to download the AJC information brochure.